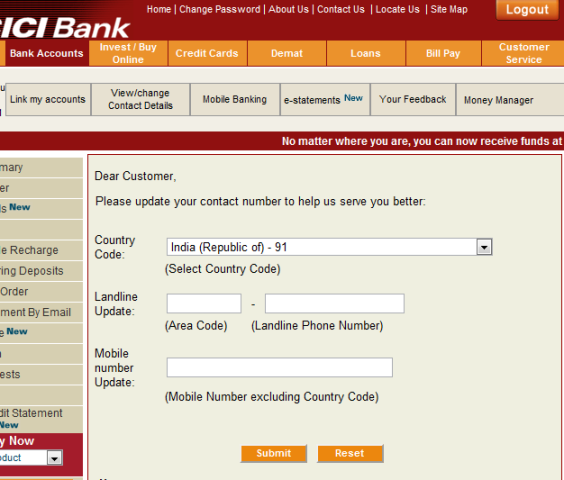 ICICI bank claims that banking with them is hassle free for the constantly moving client. Here are a few problems I faced. My son had a young star account with ICICI Trichy - opened when he was 15yrs old. He was in class X then. When he completed his class XII, we moved to Trivandrum in Kerala. My son joined Amrita School of Engineering Coimbatore. I updated our change of address online. In Sep my son turned 18 and there was a letter from the bank asking him to go to the nearest bank at the earliest with proof of id and age and upgrade his account. Please note that nowhere in the letter was there any mention of a deadline. Since he was in hostel we could not do anything about it immediately. A week or so later, my son called me at work to tell me that he needed cash immediately to pay for purchases he had made that his debit card had been blocked. I asked him to borrow some money from his classmates and make the payment. Luckily he had an account with Dhanalakshmi bank. I deposited some money that weekend in his Dhanalaxhmi account- I could not get a weekday off as I was working in a school then. He could repay his classmates only during the weekend. Needless to say, it was a very embarassing situation for him! When he came home for his Semester vacation in Dec we went to the ICICI branch in Trivandrum and stated our case. I am sorry to say that nobody there knew what to do. After 3-4 fruitless visits to the bank, they finally asked us to open a fresh account and take up the issue with the branch at which the account was originally opened. We did go there during his next vacation and the people there did not know what to do either. They asked us to take up the issue with customer care. Anyone who has approached customer care with a real problem would know what an absolute nightmare that is! Finally after running from pillar to post for nearly a year, we had to approach a relative working with ICICI bank. He had to go there personally. Finally they suggested that we close the account and withdraw the cash. SO MUCH FOR HASSLE FREE BANKING! 1. After 3 years in Trivandrum, my husband was transferred to Kurnool in A.P. As I had updated the mobile numbers and address online before, I did the same once again. The options are there - under the view/change contact details - the picture above. 2. Notice that you can't view your mobile number so you have no way of knowing whether it has been updated or not. I updated my new mobile number on this page. After a few days when I went to the funds transfer page to add a payee, I found that the last 4 digits listed were those of my old mobile number! You don't know that if your mobile number has been updated, you will get an SMS - unless it is mentioned somewhere that you will. It never occurred to me to view the mobile banking tab. Hey, I am trying to change my contact details here! Now view this - the page that opens under the mobile banking tab. 3. I just happened to click on mobile banking and got the information above. Why then, the view/change contact information in the first place? 4. Now, which tab do you think a busy lay person would open when he/she wants to change his mobile number? The view/change contact details or the mobile banking tab? 5. Don't ever make the mistake of applying for internet banking and giving the bank your new address at the same time. The password would naturally be sent to your old address as it would probably take about 7 working days to update your address. And they talk about phising!!! Opt for getting the net banking password in person unless you are absolutely sure your address has been updated. 6. Then again, why is there no option in the view/change contact details for a new address? - not that the tab is of much use anyway. 7. One last word of caution, if you are applying for a new debit card, make sure you have sufficient cash with you first - or you'll find yourself at a departmental store counter unable to pay for your purchases and the clerk announcing " the payment was declined, maybe you don't have sufficient cash balance"!!! 8. I faced this embarassment just last week. How was I supposed to know that if I apply for a new card my old one will be disabled while processing? You can always use your checkbook to withdraw cash of course. 9. I assumed -as I am sure that anybody else would - unless told otherwise - that on receiving my new card I would either have to surrender my old card to the bank or destroy it myself - that until then my old card would be valid. you can change PIN only after you use the card first. So don't be baffled if on receiving your new ATM card, you go to the ATM to change you PIN and your PIN change is not successful. when you receive a letter stating at the earliest, it means immediately. It is less of a hassle and saves a lot of time to go directly to the bank with change of contact information. If you have to give a change of address and apply for net banking, first go directly to the bank with your new address, wait for about 10 days, go back to the bank to check that your address has been updated (there does not seem to be any way to do it online). Safer to wait until you get a communication from the bank by post at the new address. AND THEY CALL THIS NET BANKING!!! Does the bank really believe that people read all the literature they are given when they open an account. Does all that fine print you can only read with a magnifying lens even contain any information a customer really needs? We are sorry to hear about all the grievances you have for our banking services. We would like to take this opportunity to resolve all the complaints you have. Please email us your contact details at care@icicibank.com and we will get back to you at the earliest to make sure the necessary action is taken. Kindly refer "1094486" in the subject line. ICICI Bank Customer Service Team. thank you customer service for the prompt response.Had I known blogging about it would evovke an immediate response, I would have done it earlier in case I. Anyway, as mentioned in the post, we resolved it with the help of a kindly relative associated with ICICI bank. Point is, this is not just my problem, I am sure there are plenty of other bewildered customers out there. You need to seriously revamp you system. A hostel student may require between 3-6 months to walk into the nearest branch with his id etc. you need to mention that and also what will happen when the grace period is over. Case II: you can see for yourself the confusion your web pages cause. point 5 is a really serious issue. A customer ignorant or not needs to be told or instructed to wait until there is a communication from the bank acknowledging the new address before applying for net banking. You also need to make a provision for changing address online. As for point 7, the people at the bank have to warn the customer who applies for a new debit card that the old one will be disabled before the new one arrives and to use the cheque book with immediate effect. As for the PIN issue, you need to rephrase your instructions to "Withdraw cash first and then use the card to change PIN" instead of "change PIN after first use" and it should be printed prominently in the sachet containing the debit card. As for helping me resolve the issues, I have resolved them myself the hard roundabout way. Again, these are not my grievances alone - I am sorry to say that some of your bank officials are more ignorant than the customer. Well Said..I'm having a tough time in changing my address and mobile number as am out of country.Probably I should write a blog too to get some help from customer care. I am facing same issue too. I need to change my contact address before I can request a new cheque book and have called ICICi customer care at least 20 times and each time either the call ends after I enter my account number or it simply us busy. And believe me I have tried doing it at different times in a day. I need a new cheque book to be able to complete the admission process of my son this month but I am stuck . ICICI bank boasts of their great net banking yet these small things are so painful for us. I have the same issue with this bank. I am in US and has a resident account in india. I opened the account in 2002. When I opened the account there is no feature called mobile number/SMS etc... I moved to US in 2003 and a frequent traveller. Now I dont hold that mobile number and also not able to update the number. When I contacted the customer care from US (1-866) number which is for NRI services, they told me to contact domestic customer care number. The NRI services is not able to generate that stupid One time password which is required to access online icici account. That is because, I havent registered a mobile number. To register a mobile number, I have to printout a pdf form online, fill up, address proof, mobile number ownership proof, send it to Hydrabad office through post. (From USA). Think about it. Is this bank really promoting customers to stay away from the bank to do the transaction or to pull the customer to the bank 3 times a day for everything starting from brushing your teeth till going to bed. same is the my case. I even cannot update my address and phone number and hence cannot make any transactions. I stay in USA and this is really bad on ICICI part. Nothing has changed till now. ICICI bank is still the same. Me and my husband are trying to update our mobile number for a long time but still it has not been done. We called up customer care and they asked us to go to nearest bank and fill the form. My husband did that but still the number is not updated. Now, ICICI representative has called my husband and asked him to go to ATM and change the mobile number there and still they say that they have "hassle free banking".What a joke!!!!!! "Hassle free banking" for people staying at the same address all their lives. I am also a victim of the ICICI bank net banking security checks - one time password and inability to update mobile number in easy way. It was working for sometime when I was abroad and suddenly stopped working when I was transferring money. If a user can access the icici website through login and password, can enter the grid numbers (meaning he owns the debit card) then why cant the address and mobile number be updated online? If bank wants strict verification, they can call back after online update and verify the account holder's information before activating the updated information. I have faced similar issues with ICICI bank especially to update the Phone Number because I travel and am outside India for most of the times. ICICI Bank used to accomodate the phone number change by calling the customer care, but they stopped that facility 2-3 years back. Believe me, ICICI bank is far better than most banks in India. I have an account in Axis bank and SBI, it takes forever to update even PAN. I had been to India recently and had to make few visits to the banks and set everything right. You still have to sign everything physically these days even though internet banking is available! I guess internet banking in India is just for viewing transcations, I feel it is not solving the purpose it is supposed to solve! Its a headache dealing with ICICI NRE accounts.Under the name of security They will asked me 50 different questions ( When I am saying I do not have debit card & check book) The next question was what is your debit card number. 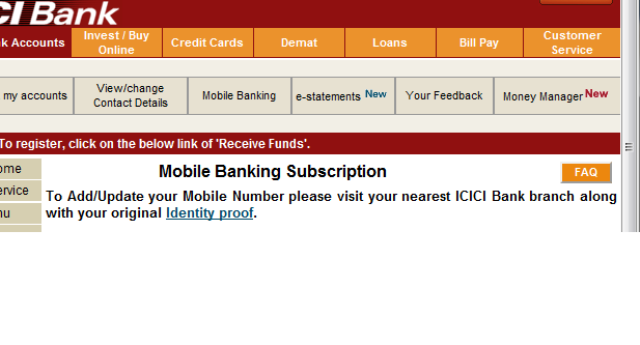 I am really struggling my icici online address last 2 days. The website is very confusing. You can not go backword You have to log in agin with first password & then OTP. and what not? I am really tired & feel really helpless. Last year I was visiting India I wanted to add my wife as joint holder She was denied & she was addedfor mendate. This year the bank officer is asking why I did not add her as a joint account holder. I am sorry to say.But it will be really difficult for you to survive in the competition if you continue with this type of service. The problem is, most of the competition is just as bad. They just recruit people and don't bother to train them properly. ICICI BANK IS A CRAP.. I HAVE STRUGGLED MULTIPLE TIMES. BEING A PRIVILEGE CUSTOMER ,PLATINUM CARD, MAKING MORE THAN 2 LACK TRANSACTIONS THROUGH SAVING A/C , CREDIT CARD NOT ABLE TO SEND FUNDS DUE TO OTP PROBLEMS WHEN EVER IN ABROAD. EVEN I CANT PAY ICICI CREDIT CARD WITHOUT OTP WHICH IS REGISTERED I SAME INTERNET BANK ACCOUNT. REACHING THEIR CUSTOMER CARE IS BIG STRUGGLE AND THEY WILL PROVIDE EXACT INFORMATION. ICICI IS PROVIDING OTP ON EMAIL BUT NOT TO RESIDENT CUSTOMERS AT NO REASON. THEY SAYS USE IMOBILE OR SOME THING ELSE WHICH I CAN IMPLIMENT WHEN ONLY I AM IN INDIA. FOR LAST FEW MONTHS FUNDS ARE COMING ONLY BUT STRUGGLING TO MOVE THEM OUT. ITS NOT FIRST TIME AND I HAVE STRONGLY DECIDED TO CLOSE 5 OF MY FAMILY ACCOUNTS, 2 CREDIT CARDS AND FIXED DEPOSITS AS THEY ARE ALSO IN THE SAME BOAT. WE ARE IN PROCESS OF IDENTIFYING GOVT. BANK WHERE LESS HURDLES WILL BE THERE AND ACTUAL BANK WILL BE OPERATED AS BANK. These guys charge you on changing payment gateway or net banking password and that too online only. (Around 250 Rs) Doesn't it look weird? I have the same problem, I have my OTP mobile number registered with ICICI, but I never get OTP to my mobile, when I enquired about this they saying I have another OTP registered with another ICICI Account So cannot do transaction with the new Privilege Account, Who should they care about this? I am Lavanya.N holding ICICI account in Delhi Vikaspuri Branch branch for more than four years. On 11th of December 2012, myaccount statement showed that there were three VPS transaction made using my ICICI Debit card. But the card was with me. So Immediately I called customer care and asked to block my card to stop further invalid transactions happening from my card. When I enquired customer care, I was asked to file a fraudulent case and as said I gave a complaint about this issue in Police station on 12th Dec 2012. And on further enquiry with ICICI customer care I came to know that all the three VPS transaction was made in 3 different shops in Bangalore. Hereby I kindly request you to take necessary action to find out the fraudulent that has happened and help me in getting back my money which is altogether a total sum of Rs.5640/- . Following are the transactions made in Bangalore. Consumer Court but so far no action has been taken on this case. Hi Lavanya. Sorry to hear about what happened to you. The only way to get things done with ICICI is to go to the bank personally and act rude and distressed. Sit there until one of the officials at the bank contacts customer care and gets you the information you want. Go to them again and again and annoy them until they do something about it. In my personal experience, this gets better results than when you are polite and try to be understanding. "what am I supposed to do?" "What would you do if this happens to you or your family?" "If your bank has personnel who don't know how to help a customer in distress, do you think I should close my account and go to HDFC or Axis Bank?"